as well as the times for the High Holy Days. wedding, we'd love to be a part of it. On Shabbat & 8th Day Pesach, 27 April 2019, we will hear from Professor Gary A. Rendsburg of Rutgers University between Services and Kiddush. Pesach this year begins on the night of Friday 19th April. If you are in need of a place to have Seder, please contact the Synagogue office. Full Service Times will be available soon. 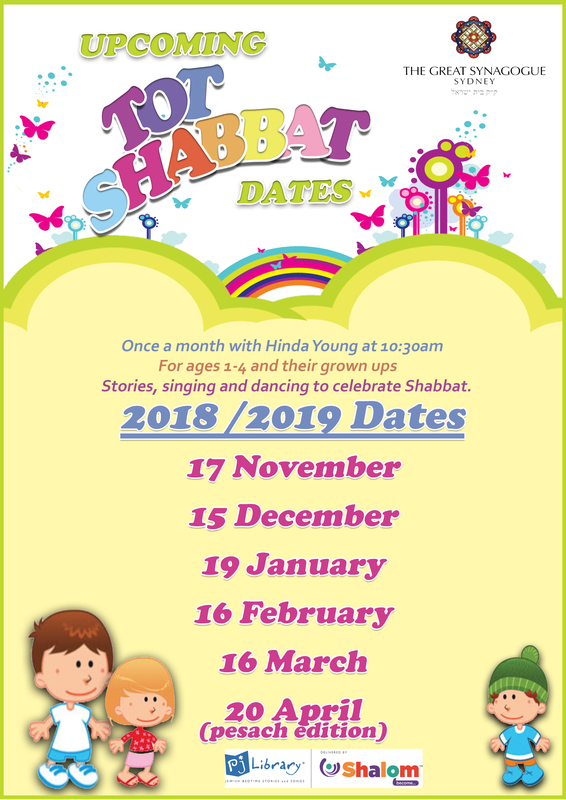 Once a month we have a program on Shabbat morning just for tots (and their adults) ages 1-4! Click below to see all of the upcoming dates. Our Synagogue stands on the traditional lands of the Gadigal People of the Eora Nation. We acknowledge and give thanks to the Elders and Traditional Custodians who have cared for this land for thousands of years. May we walk with care on this land which has provided a home for our Jewish community. We offer respect to the descendants of the first peoples whose presence and cultures are vital to the nation we share.